I received a digital galley of this book from the publisher. This post contains Amazon affiliate links. 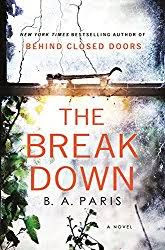 I thought BA Parris's first book, Behind Closed Doors, was a good thriller. I'm not going to lie, parts of it forced me to remember it was fiction as certain plot points stretched what I could realistically believe. Even so, it was super engaging and kept me with it and the conclusion was very satisfying and made me glad I read the whole book. Sometimes, coming to an ending can really make the journey worthwhile. Is it cheating to say I had much the same feelings about her follow-up, The Breakdown? It was a good thriller and it kept me with it even if I could generally figure out how things were going to unfold long before they happened. I thought the psychology of it was good (and I guess I should amend everything I am saying to note that her books really are psychological thrillers). The beginning was so great and pulled me in right away. Because I think it offers so much of the enjoyment of the book I don't want to explicitly spoil it. But it sets up an atmosphere in which the following events can take place. It also forces you to really put yourself in the shoes of the protagonist which might be uncomfortable considering what she does. A lot of the book focuses on well, the breakdown. Cass doubts everything in her life and is worried she's suffering from the same condition of her mother. The overwhelming sense of dread, fear, and uncertainty really fill the story. Additionally, Cass starts to feel hunted by a murdered but no one in her life will believe her. Like I said, the book was very engaging and kept me with it. I appreciate that Parris's protagonists feel human and do things that are kind of startling. It makes them interesting. However, I saw where this book was going before we got there and I think it would have been more enjoyable if that were not the case. Still, I will read her next book and I enjoyed this one and recommend it! It's been fun to discover some new thriller writers in the past couple years. I really enjoy the genre quite a lot as I find the stories generally keep me with them but they have some unexpected depth as well. What is the best thriller you've read recently?